Summary of today’s show: Msgr. 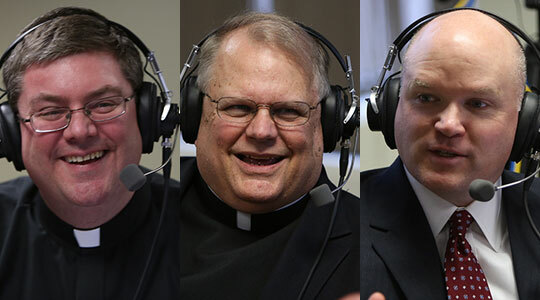 James Moroney of St. John’s Seminary joins Scot Landry and Fr. Chris O’Connor to discuss the seminary’s new Presentation Hall and Library in the former Our Lady of the Presentation church in Brighton’s Oak Square, as part of a new strategy to expand the seminary’s presence in the community that also includes new social media tools and the Theological Institute for the New Evangelization. The first major event for the new Presentation Hall will be a talk by Chicago’s Cardinal Francis George on “Lumen Gentium and Episcopal Governance” as part of a Year of Faith series commemorating the 50th anniversary of Vatican II, and our panel discusses the significance of the document today, especially as Pope Francis makes it a centerpiece of his papacy. Governance” on Tuesday, 15 October 2013, 7pm, at Our Lady of the Presentation Lecture Hall, Oak Square, Brighton, MA 02135. There is no admission fee and no RSVP is required.